At a volunteer orientation for Hope Haven in early 2018, the coordinators noticed that I had web design skills and mentioned that Hope Haven was long overdue for a website refresh. 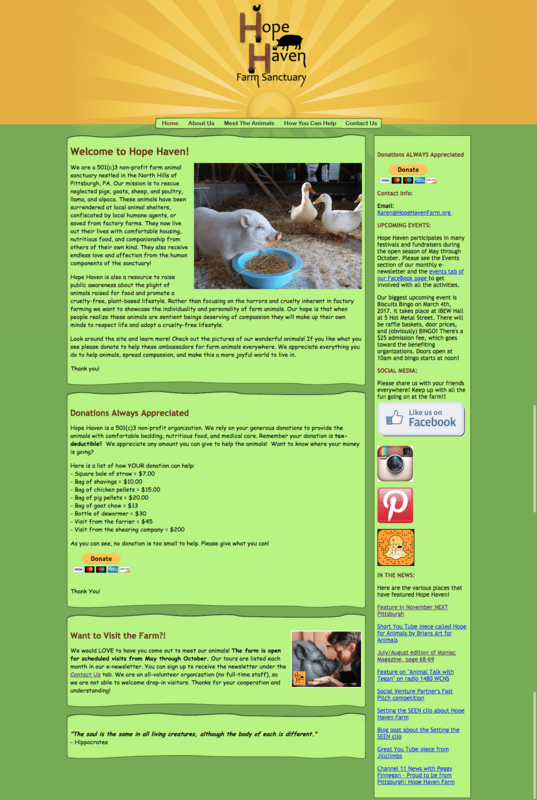 I happily volunteered my knowledge and services, as I'm in love with what Hope Haven does for farm animals and community awareness. The new website is currently not live on HH's domain yet, but you are welcome to take a look at the staging link. We are still working on the paypal donation integration as well, so the donate buttons aren't functional. The old site was not responsive for mobile devices, wasn't following the best web design practices, and Hope Haven's staff were completely locked out of being able to update any of the information without having to first get in touch with the web developer. With the new design, the founder and I wanted to keep Hope Haven's personality in the site and this meant keeping the general colors and fonts the same. I reincorporated them in different ways so that the new design feels more modern. This redesign has clearer information architecture, more interesting layouts, is responsive, and enables Hope Haven staff to easily make updates to various sections of the site without having to touch any code due to CMS integration.